Petrol companies are starting to see the changes ahead for them as more and more cars are becoming electric and hybrid. The thought of petroless cars would have been a forbidden idea to these fuel company monopolies a decade or so ago. However, the reality is these cars are becoming ever popular, and there are even government officials being driven about in hybrid and electric vehicles – just to make a statement and show the way. Looming fuel scarcity forces the need for alternative power, and now nearly every car maker has a hybrid or electric vehicle in their line-up. BMW now has two dedicated electric vehicles, and these are known as the BMW i3 and BMW i8. 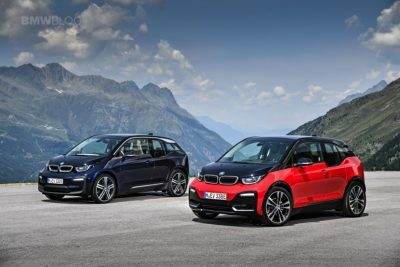 People who love sports cars will enjoy BMW’s i8, while people who need low cost motoring, particularly in the city, will be looking to the small BMW i3. It’s the 2017 BMW i3 that we’re looking at here, now into its second generation, and the result is a near flawless small hatch package. There is also a BMW i3s which looks a little sportier. Delicately designed, the new BMW i3 offers the commuter one of the best cars for the city run. Definitely a head turner, this is the EV car for ‘coolness’. Trust me; you are going to look really cool in one of these – as the i3 is futuristic, smart and quite classy. I was concerned that an EV BMW car might be a little tinny compared to the really solid models that are currently lining up on the BMW show room floor; however, the new i3 and i3s makes its quality statement the moment you open the door. Very quickly you appreciate the excellent build quality that we’ve come to expect from this dominant German car manufacturing giant. No quality is lost on this model; the doors solidly close, the materials are premium – though futuristic, the ride very good for what is a supermini for the city, and the cabin is stylishly designed. In the centre of the dash is a multimedia touchscreen which can also be controlled via a scrolling knob and buttons on the central console. The steering wheel has mounted buttons for controlling various on-board features. As soon as you board the i3 you are in a special little car. All new 2018 BMW i3 models get a new optional interior combination. You can choose a Giga Brown natural leather and Carum Spice Grey cloth. Not my ‘cup of tea’ but I’m sure it will appeal to some buyers. The iDrive connectivity gear has been updated with a larger screen (optional) and natural-language voice inputs. Apple CarPlay is standard, while you can also get real-time parking data about town. Intelligent route-planning adds to the cars amazing EV economy. Smartphone connectivity means that you can connect directly to your phone and use its uploaded features. BMW calls the i3 a “megacity vehicle”, and the new BMW i3 uses a 33.2 kWh lithium-ion battery pack and has an EPA-rated range of around 180 km. As a back up to the all-electric power is a 647-cc inline-two-cylinder gasoline generator that kicks in to recharge the power pack when needed. Normally, you would want to have your commute done and dusted by this stage, and you would be able to recharge it from the mains, ready for the next journey. BMW has a little work to do to catch the EV leaders for efficiency which are the 380 km Chevrolet Bolt EV, the 200 km Volkswagen Golf, and the new 2018 Nissan Leaf – which is projected to offer about 240 km of range. Is the car slow? Actually, no! Considering the type of vehicle it is, you’ll be surprised how it will beat a number of vehicles away at the lights. You can actually accelerate from a standstill to 100 km/h in less than 8 seconds! Any acceleration above 120 km/h becomes a bit retarded but that’s not what this car is about. Look to the BMW i8 for exhilarating EV performance. The ride is good, but you are aware that it sits on narrow tyres which struggle for grip in any serious cornering. Like most electric cars, the RWD i3’s immediate throttle response and instant torque make it plucky to drive at low speeds, while the strong regenerative braking system is great for one-pedal putting around town. 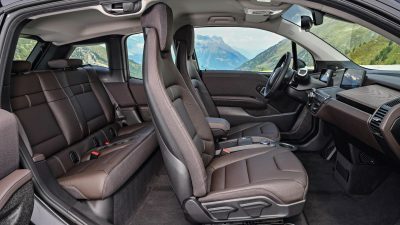 Traveling inside the new i3 is surprisingly spacious, though boot space is small (260 litres with rear seats in place). Four adults actually have lots of room, and the car is around the same size as a Nissan Micra – the length equates to 3999 mm. If you want the sportier looks, definitely get yourself into the 2018 BMW i3s. BMW highlight that the i3s accelerates more quickly, runs to a higher top speed, and rides lower on a wider track. 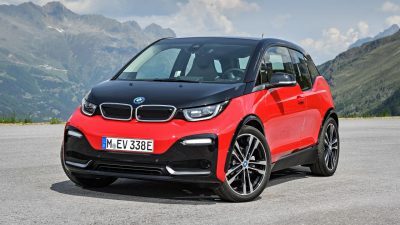 Added power allows the little BMW i3s to gallop through to 100 km/h from a standstill in around seven seconds, and with more torque and high-end power you’ve got bigger car performance in a tiny package. BMW’s i3s has modified motor controls and tapered roller bearings that help get the high-rpm performance. Chassis dynamics for the i3s have been adjusted for tighter handling, so the springs, dampers, and anti-roll bars, plus a Sport mode for the Driving Dynamics Control system gives better handling skills than the standard BMW i3. 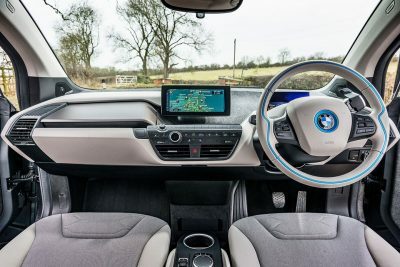 Some of the new tweaks and features that the 2nd generation BMW i3 gains are: an upper body made of carbon-fibre-reinforced plastic, a chassis made mostly of aluminium, a glossy black roofline, LED headlamps, thinner LED fog lights, restyled front and rear bumpers, new side skirts, and a chrome trim strip on the hatch. BMW i3s models also boast a gloss-black wheel-arch moulding, model-specific bumpers, and additional gloss-black trim. Exterior colours for the i3 adds a new Melbourne Red and Imperial Blue paint job into the mix. For a dynamic supermini city car, we can applaud the latest BMW i3 offering. For any more information on the latest BMW i3 models or, for that matter, any other new car, contact one of our friendly consultants on 1300 303 181. If you’d like some fleet discount pricing (yes even for private buyers! ), we can submit vehicle quote requests out to our national network of BMW dealers and come back with pricing within 24 hours. Private Fleet – car buying made easy!